As we approach a new season and start to feel a chill in the air, it’s only appropriate to talk about layering. Not just for warmth, but for style, too. 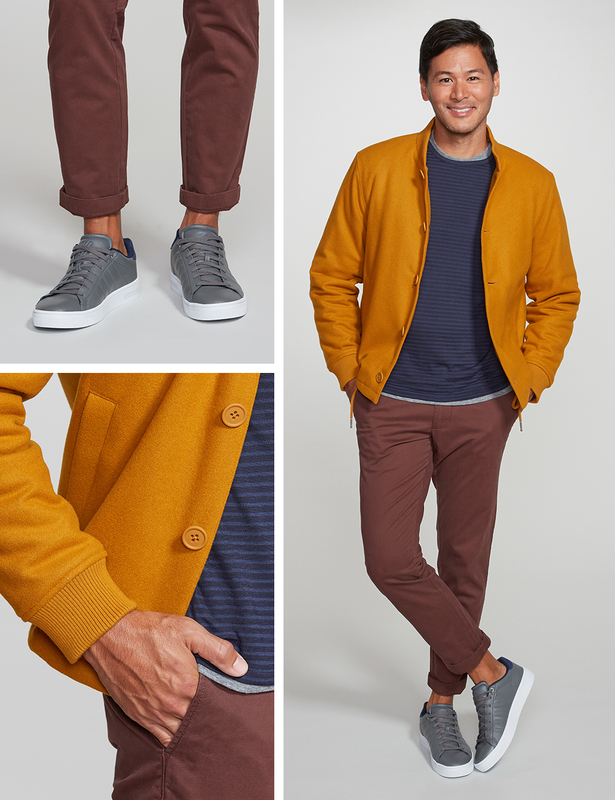 We’ve selected three categories to think about when pulling together an outfit with layers. Master one at a time, or if you’ve got the hang of it, feel free to combine. Your choice of outerwear matters, especially when working with a longer coat. 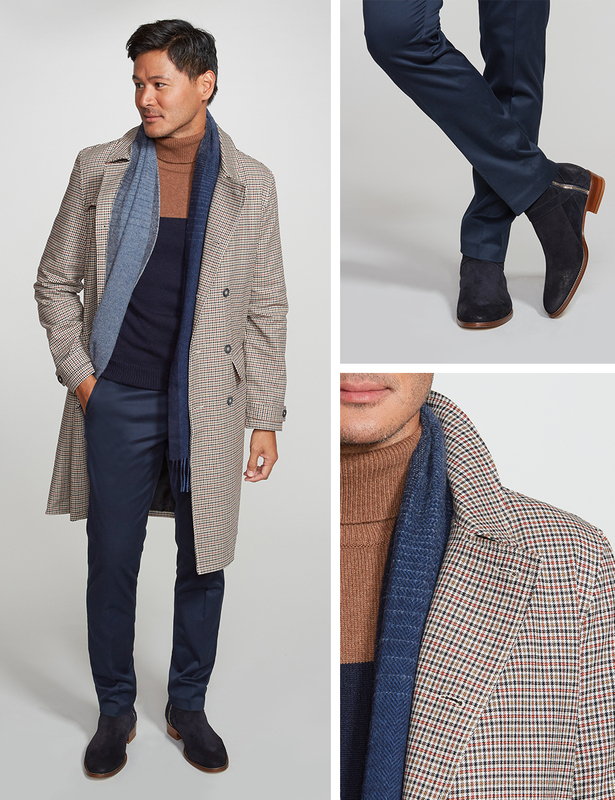 If your topcoat hits between your mid-thigh and knees, keep your outfit underneath relatively formfitting. 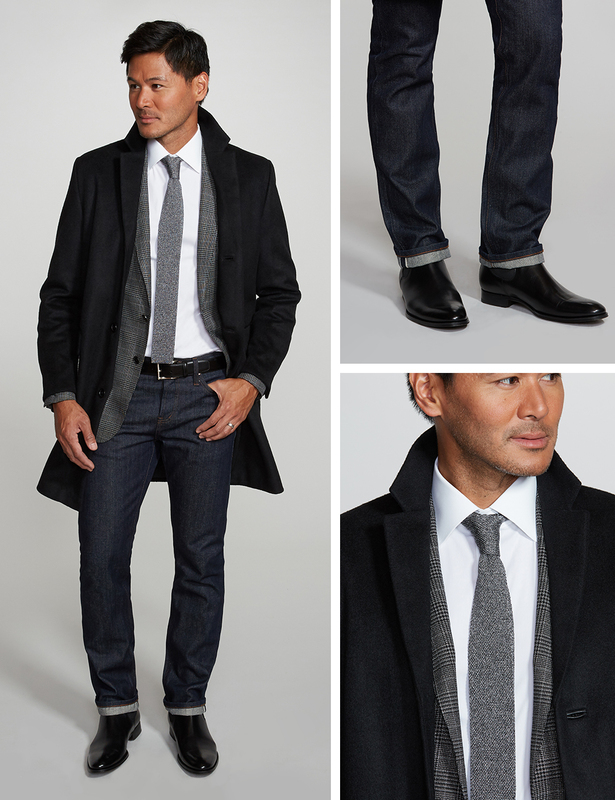 Reach for slim or slim-straight pants and sweaters without much bulk, then tie it all together with a sleek boot. The clean, straight lines will make you look taller, as well as allow for your coat to be the star of the show. Always ensure your topcoat is longer than your sport coat or layering jacket. Stick with one statement piece per outfit. That might be your favorite pair of flashy sneakers, or in this case, a great mustard bomber. But that’s not to say you can’t add more color elsewhere. We’ve layered two simple tees under the jacket, choosing to stick to neutral shades of grey and navy to balance out the pop of color from the bomber. A simple pant, like these burgundy chinos, ground the look. Overlapping textures may be the less obvious way to layer, but it’s still a very visible way to mix things up. You really can’t go wrong starting with a crisp, white shirt. Balance out the polish of the shirt with rustic-looking fabrics and details like a knit tie or selvedge denim. As far as sport coats go, choose one with visual texture in a windowpane check or a plaid. And with all that going on in your outfit, it’s best to stick with a smooth leather shoe.